Shavasana Disco have announced their second meditation event, which will celebrate the rock icon's seminal debut album. Shavasana Disco have announced a Jimi Hendrix listening party to celebrate 50 years since the release of his Are You Experienced? album. The event - which will begin with a guided group meditation led by Will Williams Meditation founder, Will Williams - will play The Jimi Hendrix Experience's debut studio album in full. 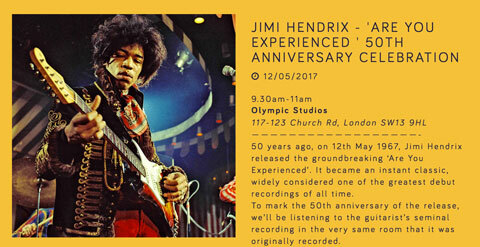 The album playback will be hosted on 12 May at Olympic Studios- the very place where the rock pioneer originally recorded the album in 1967. Tickets free and are available via special ballot, with the winners to be announced in April, before the event on 12th May. Shavasana Disco are the same team behind the special David Bowie event, which saw fans celebrate what would have been the late icon's 70th Birthday with a meditation and a playback of his seminal Ziggy Stardust and Diamond Dogs albums.